With summer now just a vestige of a memory heating up the recesses of our minds, we’ve reached a point at Culinarian where the semester is dragging on through a barrage of cold nights spent writing mid-semester papers. The change to darker days has been rippling through New York since the semester started back, creeping up behind us and leaving us searching for something of comfort to grasp onto and brace ourselves for hibernation. In true Culinarian style, of course, we turn to food. Whether the air is laced with overbearing heat or with a few struggling rays of sunlight, food comforts. Summer days spent at home, lazing around, picking at endless mountains of leftovers: this lulls us into reassuming old childhood expectations of the fridge constantly being full and dinners materializing out of nowhere. The pastries from your favourite bakery, stains on paper bags where the butter leached through, or the scent of coffee beans or tea leaves as your hands hug the mug closer to your face. The mere thought makes us warm. 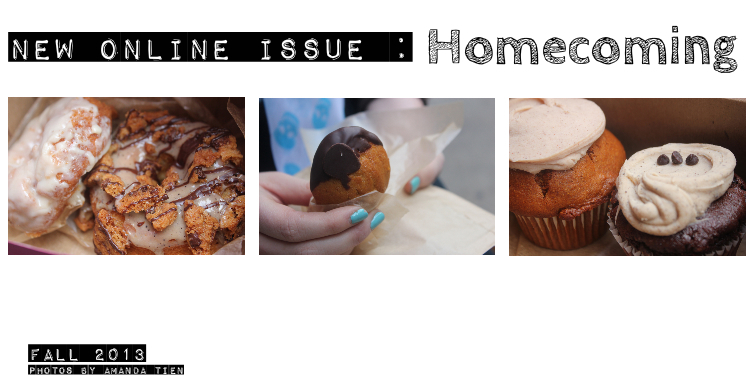 Food is forever colliding with comfort, with memory, and it’s from this inspiration that we’re exploring the theme of Homecoming for the new Online Issue. When we say “Homecoming”, most Columbia students probably think of “Roar Lion Roar” bursting over Baker Field, screaming cheerleaders, and iced cupcakes of white and baby blue. While these trademarks certainly typify Columbia’s annual sporting event, a day of heightened school pride, the idea of Homecoming goes further than that. It represents the university’s students, alums, faculty, all celebrating their belonging. It represents those things that make Columbia special, those shared experiences that span from freshman year beyond senior year, like craving for a favorite Milano sandwich, and eagerly unwrapping the parchment as the warm, salty smell assaults your senses. Coming home to Columbia is the restaurant you always trek to, no matter how hard it’s snowing. It’s hallal and Chinese from the best food cart, hot cider from the farmer’s market outside Lerner. These things make Columbia feel like home. Over the next six weeks, we’ll be feeding you mouthfuls of comfort in weekly doses. We have recipes, restaurant reviews, features, op-eds, all waiting to be devoured. Rachel Wangler will be embracing her food intolerances and succumbing to the lure of baked goods. Andrea Zhu will be deciphering the scents of the Orient, whether popular Chinese has any relation to authentic Chinese, and where you can find it on campus. Grace Jamieson will shed some light on the collision of high tea and home tea. We have some delicious installments in wait, with some talented writers and engaging photographers. By following the website and our Facebook, you’ve been following the progress of Culinarian so far and we’re so thankful for your ongoing support. We’ll be running these online issues in alternation with our print issues, staying true to our high standard of writing and editing, design and photography, and we hope you love it as much as we do. But these are still just our beginnings, we have so much more to share with you, so jump in the backseat with us, let us take you for a ride, let us take you home. Welcome to the “Homecoming” Issue. Click here to view all posts that are part of the Fall 2013 “Homecoming” issue, and click here to see all of our online articles. Click here to see the masthead for the magazine (scroll down to the bottom — you’ll even find the dates for every writer!). Tags: Fall, Homecoming, Online Issues. Bookmark the permalink.